Ages 5 and up. 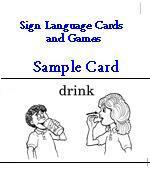 Use these cards to introduce your students to American Sign Language. Each card includes a printed word and the sign for that word. Cards showing nouns and verbs include illustrations. Each of the 60 cards is 5.5"x 8.5. "Games that can be played using the cards are included.